Splash the olive oil into a small saucepan over a medium-high heat. Add the onion, garlic and spices. Sauté for a few minutes until everything is heated through and your kitchen smells fragrant. Add the chickpeas, couscous, raisins, apricots, orange juice, lemon zest and juice, and salt and pepper. Bring everything to a simmer and then reduce the heat to low, just enough to maintain the simmer. Cover with a tight-fitting lid and continue cooking until the couscous is tender and the liquid has been absorbed, about 15 minutes. Turn off the heat and let the couscous rest for another 5 minutes or so before serving. 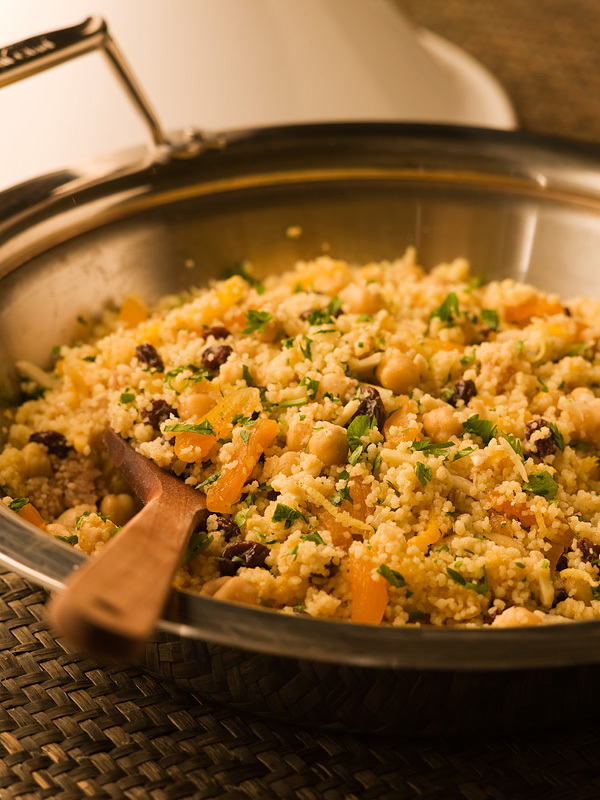 Using a fork to help fluff up the couscous, transfer it into a serving bowl and sprinkle with the almonds and cilantro. In Morocco couscous is normally seasoned with a pinch of ras el hanout, a unique spice blend whose name means literally “top of the shop”the spice merchant’s best. If you like, you can make your own ras el hanout by roughly combining equal parts of cardamom, cinnamon, cloves, coriander, cumin, ginger, allspice, nutmeg, mace, turmeric and black pepper. 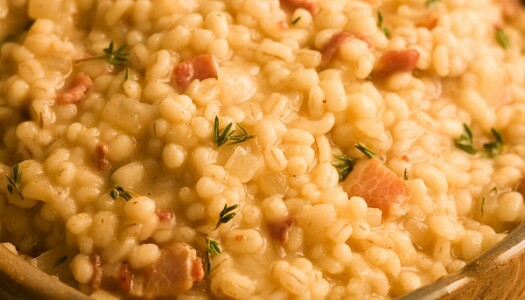 Use 2 teaspoons in total for this recipe. This is a tasty side dish that can be banged out in five minutes. Couscous is a tiny type of cracked, granular pasta that’s already been cooked and dried. It’s actually easier to use than other pastas. Just soak it in some boiling liquid and it’s good to go!